We add a shed to the front of the tiny house, rough in our electrical wiring, and get most of the siding in place. Progress has slowed down a bit, partly because we spent over a month traveling around taking care of non-tiny-house-related business. That means we have a cold month ahead of us as we try to complete the project as a Christmas present to ourselves! We’re looking forward to getting the siding completed and the insulation in so we can start working on more exciting things – inside the house! We took a rather long break from our tiny house build to head down to Annapolis. For three weeks we camped out and worked to set up, tear down, and man the gates at both the sail and power boat shows. Since we were in the area, we also stopped by Baby Blue to get her ready for winter on the hard. We thought we’d share what we’ve been up to in a new Sailing Baby Blue episode. To see our progress on the tiny house, check out the photos here or watch the first two videos. The first time I remember discussing tiny houses was when we were living in Denver. It was the winter before we sold the house and I was looking for something to do for the night. I saw that Dee Williams, author of “The Big Tiny: A Built-it-Myself Memoir”, was speaking at the Tattered Cover. I hadn’t read the book, but it sounded interesting and like something Jon might enjoy too, so we went. On the floor of the bookstore, the author had taped off a life-size layout of her tiny house. As I listened to her talk about the tiny house movement and gazed at the taped off partitions for the kitchen and toilet, I thought to myself: I am never doing that. Jon on the other hand, was all about it. My main objection was the trailer. I understood that the point was to avoid needing permits, but it just didn’t seem worth it if you had to build such a tiny space. I enjoy a small, cozy house, but the idea of limiting the size to something that could fit on a trailer did not appeal to me. Maybe bureaucracy and rules just didn’t bother me quite enough to want to live on a trailer, and the whole concept of being able to move it seemed like more of a burden than an advantage. One of the other options we considered was renting an apartment so we could get started right away on building a home that would stay put. But we rationalized reasoned that with the money we’d be paying in rent, we could instead have a little home we will use for years and years. Even after we build a more traditional home we can use the extra space in the tiny house for guests, a private work space, or vacation rental. We’ll also be avoiding commitment – which always sounds good to us- by having the choice of either putting down roots or continuing to live like nomads depending on how things play out. After a number of serious conversations on the topic, we weighed the alternatives and decided that the tiny house on wheels was the way to go for us right now. Someday I still want my funky cob house or a yurt when we have the land and the time to build our forever home. For now I’m happy to practice on our tiny house, and actually, I’m truly excited about it. Apparently, Jon can be very convincing. Why is it that everyone seems to give such vague answers to this seemingly simple question? Maybe they have a fortune stashed away in some offshore bank account to fund their trip and don’t want the IRS to catch wind of it, or they’ve discovered some get-rich-quick scheme that actually works and aren’t interested in letting you in on the secret. While this could be true for some of the mega-yachts out there, it’s not likely the case for your average cruiser. So what does it cost to go cruising? Well, it really depends. People who are otherwise so willing to share their cruising experiences with anyone interested are not suddenly tight-lipped about the costs because it’s none of your business, but rather because it varies so widely depending on how you do it. Let me first explain a little about why it is so hard to give a concrete figure and then I will share some averages for the costs of our 2 year trip down the Atlantic Coast then through the Eastern Caribbean and back. Ashley and I did initially have a monthly budget in mind for our trip but this figure was based mostly on how much money we had in the bank, how long we wanted to be out cruising, and how much money we hoped might still be in our bank account when we returned. The budget wasn’t based on the hard to predict realities of the cruising life. An unexpected mechanical breakdown is the most obvious example of something that could quickly wipe out a couple months of your allocated funds, but there are a lot of other reasons that sticking to a budget while cruising is difficult. After several months of not coming close to staying within our arbitrary budget, we realized it wasn’t working for us and mostly stopped keeping track. One of the reasons working within a monthly budget is so difficult while cruising is we tend to spend money in large lump sums while provisioning in certain locations. On our way through Puerto Rico for example, we wanted to rent a car to do some sightseeing and also to do a large provisioning trip before heading back to the Bahamas where groceries are far more expensive. So within a few days we had spent $200 for a rental car, close to $500 on groceries, $75 on diesel, $70 for some random odds and ends at Home Depot, $30 to fill our water tanks, and $12 to fill our propane tank. Also while out exploring with the rental car, it’s hard not to stop for a meal out, and if there happens to be a marine supply store nearby, certainly there will be something we need from there as well. After a massive spending spree like this we try to go someplace where we can swim, hike and lounge on the beach for a while to try to balance things out. We found the easiest way to avoid spending too much money is to go someplace where there is nothing to buy. While there are plenty of cruisers who have gone a lot further than us with less, I would say we are at the lower end of the spectrum budget-wise. If your idea of cruising is pulling into the marina at the end of the day, passing your lines and some generous tips to the dock hands, then heading for the bar to start up a healthy tab, your trip is going to cost a lot more than ours did. In the beginning of our trip we fell into this trap, determined to do everything as cheaply as possible. Pretty soon we felt like we were missing out on too much by not springing for the occasional rental car, guided tour, or dinner out. Rowing the dinghy might be the simplest and cheapest option but we found that without an outboard, we couldn’t get to some of the best snorkeling spots and sometimes stayed on the boat because I wasn’t feeling up to battling the wind and current. In the end, our living expenses while out cruising weren’t that different from what they had been onshore. Though we made a lot of sacrifices while saving for our trip, we still went out to dinner once in a while, went to the movies, bought some new clothes and enjoyed other luxuries; so we shouldn’t have expected to suddenly be happy going without while living on the boat. Living and cruising aboard a small boat is hard work and sometimes allowing for a few of the comforts you were used to at home will go a long way towards keeping the trip fun and the crew content. You and your crew might be setting yourselves up for disappointment if you are planning on making a major departure from your current lifestyle in order to afford your cruising dream. There is a lot that can be said on the topic of budgeting for cruising. So, at the end of this post I have listed some books we found very helpful in the planning stage of our adventure. To give you some actual numbers we have gone over our bank balances and come up with a monthly average of our expenses over the last 2 years. The math was pretty easy as money has only been flowing from our savings account in one direction. For almost 2 years of cruising, 16 months of which were outside of the US, we have averaged $1000 a month for living expenses. 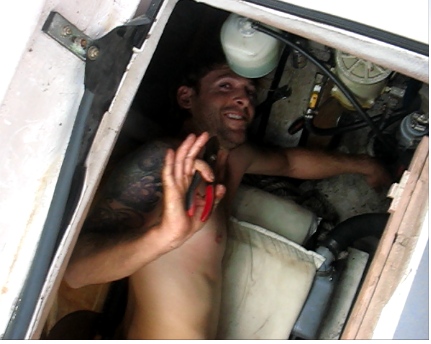 This includes all the day-to-day necessities of living on the boat: food, water (which you generally have to pay for in the Caribbean), fuel, laundry, regular maintenance on the boat (oil and filters, varnish, small fittings, etc. ), entertainment (tours, car rentals, dinners, drinks, movies), customs fees for clearing into various ports, occasional mooring fees, the very rare stay at a marina, wifi access, Delorme inReach subscription, and prepaid phone plans. *This does not include the purchase price or initial outfitting of the boat (such as a life raft, foul weather gear, EPIRB etc. ), insurance, and major repairs or refits (luckily we have not had to make any during the trip). When we are back in the US we will have to spend some money on a haul-out, bottom paint, and lots of other small maintenance and repair projects. **We also did not include the cost of our flights home from Grenada. If you are planning on being out cruising for more than a year you are likely going to want/need to fly home at some point, so you might as well set aside funds for this purpose. Groceries: This is our primary expense. We definitely pay more attention to prices while shopping than we did at home, but our costs for food are not much different than they used to be. Some Islands including Puerto Rico and Martinique have large chains with prices very similar to the US, while in other places such as the Bahamas the selection is pretty limited and prices are high. In Grenada, Dominica and the Dominican Republic, locally grown, fresh produce was very affordable from roadside stands. The French islands are a great place to stock up on wine. If you talk to other cruisers who have been where you are heading you will figure out what to buy where. If you are determined to eat exactly the same way you did at home, you are likely to be disappointed with the selection and prices. As far as dining out we have had some excellent, inexpensive local fare from food trucks and street vendors as well as restaurants you would likely steer clear of going by US standards of appearance. Be adventurous. Fuel: Yes, you may be on a sailboat but don’t underestimate the amount of fuel you will use. We do our best to sail whenever possible, but our fuel expenditures were still significant. Our trip down the ICW presented few opportunities to hoist the sails and took a considerable amount of motoring. On some small out-islands in the Bahamas diesel may cost 3 times the US price. When we find a good price we fill the tank and all of our jerry cans. Where it’s expensive, we only get what we need and a little reserve. It’s worth checking the gas station prices against purchasing fuel at the marina. We’ve saved as much as half the price at the marina by hauling jerry cans from the gas station instead of pulling up to the fuel dock. We did not keep a log of fuel prices and gallons taken on, but based on our engine hours, average fuel consumption, and an average of $4 for a gallon of diesel we spent around $2000 for fuel during our 2 year cruise. We did occasionally run the engine to charge the batteries, but most of the engine hours were while under way. Customs fees: The Bahamas, Turks and Caicos, and the Dominican Republic are some of the more expensive countries we visited, ranging from $100 to $400 depending on the length of your stay and length of your boat. In the rest of the Eastern Caribbean, the price is much less at around $30 or even free, as is the case for clearing into some French islands. Moorings / Marinas: We anchor as much as possible but have spent some time on moorings when anchoring isn’t an option or when use of the marina’s amenities seems to justify the cost. In some places a mooring also includes use of the pool, showers, and laundry, making it well worth the price for a couple days. We’ve never paid more than $30 per night for a mooring – with the average cost typically $20 from Maine to Grenada. We also chose to put the boat on a mooring during our trip back to the US rather than leaving it at anchor or hauling it out. (Be wary of where you pick up moorings. I’ve seen many while snorkeling that I wouldn’t trust to hold our dinghy.) We’ve stayed in a slip at a marina exactly three times and paid around $1 per foot per day, and $180 for a week at a marina in Grenada. Communications: We bought SIM cards with data and voice plans for our unlocked smartphone in the countries where we stayed for long stretches. A SIM card normally costs between $10-20 and data plans were around $20 for one gigabyte. On average we spent $30 for each month we were out of the country for cell phone plans, but our cost for communications was much higher in reality. We went out for drinks and coffee more often than we otherwise would have in hopes of taking advantage of free wifi – with mixed results. A few times we stumbled upon restaurants or cyber cafes with truly fast internet, but that was certainly not the norm. We also had a satellite subscription for our Delorme inReach that allowed us to send text messages when out of cell range for $12/month. Insurance: Being relatively young and in good health we decided to take the risk of going without health insurance for the trip. For most minor injuries or visits to the doctor medical costs in the islands are quite low and would have likely been under our deductible anyway. A serious injury or illness could have ended our trip and left us with some very large bills so this was not an easy decision to make. Some kind of catastrophic coverage in case of a serious injury or illness requiring treatment back in the US may be a wise choice. Carrying insurance on your boat is required for any stays in a marina or haul-outs at a yard. Going without any insurance could easily end your trip and leave you with some very large bills if you were to drag anchor and damage someone else’s boat. A liability only policy may be an option to save some money if you are cruising on an older boat and willing to take the risk. We also had affordable coverage for search and rescue expenses through our Delorme plan. Costs back at home: Having sold our house, car, and most of our possessions before leaving, we do not have expenses such as a mortgage, car payments, or storage unit fees to worry about. Though we thought about hanging onto our ties back home, letting everything go simplified our lives immensely and was the quickest way to get us out cruising, but this approach is definitely not for everyone. It also meant we needed money set aside for re-entry or emergencies. We didn’t want to come back penniless and with no place to live at the end of our cruise. The seemingly most obvious factor in determining what cruising will cost is the price of the boat. While most people probably focus far too much on saving for the right boat for their dream cruise without putting much thought into the other costs, the boat does set the tone of your cruise. The range of what different people consider to be an appropriate boat for cruising is vast. We have seen just about every type of boat imaginable out cruising; from home built plywood creations to 40-year-old pocket cruisers to multimillion dollar multi-hulls. There are a lot of books out there about small, older cruising boats that are seaworthy and affordable and I have listed some in the recommended reading section. I am definitely not an expert on boat design so my opinions on this probably aren’t worth sharing here. Based on what I’ve seen, the condition of the boat and competence of the crew are far more important than any certain design aspect. It is worth noting that our trip down the US East Coast and island hopping through the Caribbean has been closer to coastal cruising than blue-water sailing. The longest passage we made took three nights and four days. But it’s possible to make the same trip down through the Caribbean all the way to Grenada or Trinidad with only two or three overnight sails. Most of our trip has consisted of day-hops within 50 miles of land. Deciding what kind of passages you’re comfortable undertaking will go a long way in narrowing down your choices for a suitable vessel. We set out to find a seaworthy boat that was as small and simple as we could feel comfortable (or at least, be able to tolerate) living aboard. We only looked at boats listed for $35,000 or less. This approach worked out well for us and led us to a 33 foot, 45-year-old boat with no refrigeration. For most cruisers, living aboard our boat would feel too much like camping and not come close to their idea of comfort on the water. If you are planning on doing a shorter trip – down the ICW and one season in the Bahamas – going small is a great idea. You can spend the money you saved on outfitting the boat and treating yourself to an occasional stay in a hotel, marina slip, or a flight home. If you are planning a longer trip, comfort will be more crucial and going a little bigger is probably a good idea. Baby Blue worked out very well for our trip but I think we would get a larger boat if we ever do any cruising beyond the East Coast and the Caribbean. Another thing to consider when deciding what percentage of your funds you will spend on purchasing the boat is depreciation. Cruising is tough on gear. Even if you make a lot of upgrades to your boat, you can’t count on being able to sell it for the same price when your trip is over. If you are an aspiring cruiser of modest means here are some tips to help you get there. None of these are original ideas of mine but rather advice picked up along the way from wiser sailors. -If you think you are going to make a dramatic lifestyle change to make your cruising dream a reality start simplifying right now to get a feel for what life aboard will be like. Living on a small boat and cruising with limited funds is certainly not easy. It is often uncomfortable, stressful, and hard work. So start getting rid of all that stuff you won’t be able to take with you and saving as much as you can right now. -Don’t buy the boat too soon. While living aboard a boat is affordable compared to paying rent or a mortgage, just owning one is expensive. Instead of spending your savings on slip fees, haul-outs and maintenance, wait and buy the boat closer to the time you are ready to set out on your cruise. -Don’t buy a project boat just because it is what you can afford right now. 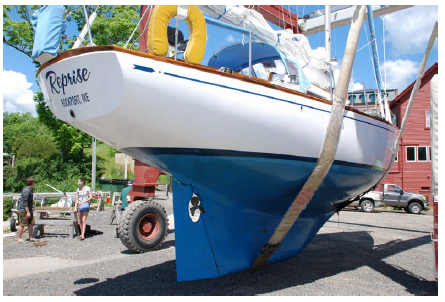 There are an awful lot of project boats sitting around boat yards or in backyards years after someone was planning to fix them up to go cruising. Focus on saving your money and worry about finding the boat later. Unless you have a lot of experience working on boats, a fixer-upper is probably not a good bet to get you out cruising anytime soon. -Are you really going to sail around the world in the first boat you own? There are people who have done it and written some amazing books about their journeys, but if you set slightly more modest goals you can probably buy a much more affordable boat and go a lot sooner. There are a lot of beautiful places to cruise that don’t require buying that perfect blue-water boat of your dreams. Give the cruising thing a try sooner and then set some more long term goals. After cruising for a year or so you will probably find a different boat to put at the top of that list anyway. -When you do buy the boat, get out and sail it! It’s tempting to head straight for the closest chandlery to buy a bunch of really expensive gadgets to add to your beautiful new boat. As long as the boat is seaworthy, resist the temptation to make a bunch of upgrades right away. Give some of that old beat up-looking gear that came with the boat a try to see what works and what truly needs to be replaced. There are marine supply stores everywhere. You can buy those shiny new gadgets along the way after the old ones wear out, or more likely realize that you didn’t really need them anyway. We found some old lists of “must do” upgrades from before we left for our cruise that we haven’t gotten around to 2 years later, so maybe they weren’t all that important in the first place. Gaining as much experience sailing your new boat as you can is probably a better use of your time than spending hours perusing the aisles of your local chandlery. After you have some experience you will have a much better idea about what really is an improvement and what is just a waste of your cruising funds. -Having ground tackle you can count on and knowing how to use it will save you money in the long run. Marina slips and mooring fees add up fast, so being comfortable anchoring out will help stretch your cruising funds. Not to mention what it could cost if you drag anchor and wreck your boat or someone else’s. Get equipment you can trust, learn how to use it, and sleep well. This is a great introduction if you are considering cruising and offers a lot of practical tips to help you get there. We modeled our escape from our 9-5 lives after these valuable ideas. For those interested in long term cruising, this book will give you an idea of how far you can go and just how thinly you can stretch an extremely small budget. This book does an excellent job of breaking down the variability of cruising costs; comparing the cruising lifestyles of three categories of boats and their crew. I have read everything the Pardeys have written. Even if you are not planning to set off around the world on a home built, engineless, 24-foot-boat, their stories are entertaining and you’re sure to pick up some great advice on simple living. This book and several similar titles can give you an idea of some boats that may work well for cruising without spending a fortune. It’s a little late, but after getting a lot of questions about how much it cost us to go cruising, we decided we should share our initial outfitting costs along with our monthly expenses. Some of these prices are estimates and I’m sure we’re forgetting a few things, but it should be pretty accurate. 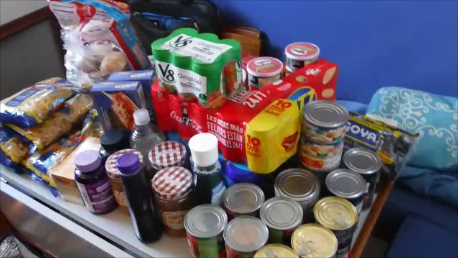 We’d never taken the time to tally everything up, so it was a little shocking for us to see the total at the bottom. We’re back in the US* and it feels a little strange. Here are some differences between the Caribbean and living in the big city (by which I mean Denver, of course). I haven’t seen anyone walking down the street holding a machete yet, and if I did I would run away. Everywhere I look there’s a tv. When it’s tuned to the news, I keep waiting to hear, “and live from New York it’s Saturday Night!” Because it seems in every way more like a parody of the news than actual news. It’s sooo cold. “Can we turn the AC off?” I can’t take being blasted with freezing cold, 72 degree air. It’s dry. Drinking enough water is impossible. I had to make an emergency run to the grocery store for some extra-strength lotion to hold my skin together. My allergies are gone. Jon’s allergies are back. Everyone is in a hurry. I guess they need to be certain places for specific things that happen at scheduled times. Even the toilets are serious. Water comes from the tap in inexhaustible quantities, available with a flick of the wrist. For the first few days, taking a shower felt like heaven. I am still amazed that the feeling of cleanliness continues into the next five minutes and beyond; there’s no subsequent sweat-shower making regular bathing seem rather pointless. Sleeping through the night is easier when I don’t have to wake up every other hour to either open or close the windows, depending on whether it’s raining inside the boat or stiflingly hot. Crossing the street is always exciting when I’m not entirely confident which direction the cars are going to come from. Riding the bus is a quiet experience. Because there’s no crescendo of soca music as the bus approaches and no conductor leaning out the window asking if I need a ride, it’s important to pay attention to make sure I won’t miss the next bus that comes along. There’s no reason to say “good afternoon” to the passengers on either side of me and I don’t have to wedge myself between them because everyone is wearing earbuds and taking up two or three seats each. If I didn’t know any better I would assume I’m on my own here, and it makes me think how hard it would be as a foreigner in this country, not speaking the language. But I guess there’s always Siri if ever we find ourselves in need of help. So, is it weird being back? It feels too cliché to say we’ve gained a new perspective on our old lives. But for all of the above reasons, yes, it’s kind of weird to be back. It’s also really easy to get used to the convenience of modern life once again, and any new-found perspective tends to fade quickly. It’s also good to be back. I’m so grateful for the opportunity to work for awhile to refill the cruising kitty, which wouldn’t have been possible without our friends offering to let us stay with them. I think we needed a little break from the cruising life, to reconnect with our friends and family, and maybe even to get a glimpse of what things would’ve been like had we never left. I would’ve been able to walk to work from our old house, our house would’ve almost tripled in value, we would’ve had no debt and could’ve taken advantage of the hip new restaurants popping up all over the place in Denver. We could’ve had a baby. All of that would have been great of course, but after seeing our alternate future I would still make the same choice to leave. In a way, there was no other choice for us, and feeling that way renews my excitement to be where we are now. Because everything is different when you know that you have options, and that you chose the path you’re on. So as much fun as I’m having here, I’m also looking forward to returning home, and home is where the boat is. *Yep, this post was due over three months ago. Prickly Bay was our first anchoring stop in Grenada, largely because it sounded familiar and was the closest harbor after we rounded the southern tip of the island. We spent a week there familiarizing ourselves with our new digs: figuring out where to get on the bus to find groceries, where to find the fastest wifi, meeting our neighbors, etc. We also did the bare minimum amount of work on the boat just to say we got something done. I polished our stainless steel and Jon replaced our gear shift cable that broke way back in the BVIs. But most of the time we concentrated on slowing down. We met up with friends we had met along the way and made some new ones, spending probably too many evenings drinking good beer at the West Indies brewing company. In search of the most convenient spot to initiate our soon arriving new crew members, David and Rachel, into the cruising life, we moved over to Mt. Hartman Bay and landed with a thud – there was a sudden gust – on the dock. I had convinced myself that our guests would be arriving at 10pm that evening, so with some time to kill we joined friends at the brewery (again) and then decided we would just walk several miles to the airport. Luckily, the walk didn’t take terribly long because their flight actually landed at 8pm. They were just exiting customs as we walked up and it occurred to me that military time conversions are not second nature to me and therefore worth double (or triple) checking. David and Rachel left for their round-the-world adventure a year before we did, and we left Colorado a month or two before they returned so it had been two years since we last saw each other. It probably sounds strange, but knowing that they would come to visit us in Grenada if we made it by July was a big factor in our decision to continue south. They sent word that they were ready to buy plane tickets around the time of our long beat to windward along the south coast of Puerto Rico, when we were both pretty over being on the boat and weren’t sure what to do next. We didn’t really want to turn back after all that work and weren’t comfortable with staying put, so their willingness to travel to Grenada gave us the shot-in-the-arm we needed to keep going ourselves and we’re so glad we did. It was wonderful to see our friends again and introduce them to our new lifestyle. The week flew by as we did our best to take in the island while comparing our traveling experiences and exchanging stories. Of course we took them to the brewery. We showed them how we make the most of a ridiculously steep incline. We tried to get a glimpse of the crater lake at Grand Etang. But instead just enjoyed the cool breeze. I wasn’t alone in my love of goats. I think we fed all of them at Belmont Estates. We finally left the dock to go sailing and snorkeling at the sculpture park in Moliniere Bay. Unfortunately Bobbie didn’t have her little engine quite yet. Yep, that’s Bobbie with her tiny new motor. I wouldn’t say we finally broke down and bought an engine, as it has been pretty easy to row to shore from our prime spot in Mt. Hartman Bay in Grenada. But when we heard someone on the morning net offering up a 2 horsepower 2-stroke for a decent price we decided to jump on it. Now we’ll have an easier time making it to shore if we end up at the back of the fleet on our way up island, and we’ll be able to check out all those far flung snorkeling sites. Hopefully when the novelty wears off we’ll continue to row occasionally – you know, to prevent any loss of muscle tone – but right now we’re highly enjoying zipping around (still slower than everyone else). From Bequia we had only 76 miles to travel to get to the southern tip of Grenada. The forecast everyday was for 25 knot winds and six foot seas. Normally we wouldn’t go out in those conditions, but we were ready to get it over with and reach Grenada in time to prepare for our friends upcoming visit on July 10th. We left Bequia with the wind blasting behind us. I felt as nervous as I had when we first started sailing back in Maine and insisted that Jon and I both wear our life jackets and harnesses. This helped to eliminate my need to think through each step I would take if Jon were suddenly knocked off the boat, so I was able to relax a bit. Once we left the protection of the islands, the waves picked up and we entertained ourselves by trying to guess just how big they were, comparing them to the biggest we’ve seen. Later that afternoon we anchored in Charlestown Bay, Canouan, just outside the moorings which held the only two other boats in the harbor, both charters. Squalls were predicted for the next day and we decided to stay put to wait them out. That next morning I declared that I would not be leaving the boat at all and was just going to relax. I had had my fill of long hot walks and decided I’d seen enough until we reached Grenada. Jon felt obligated to go ashore for a look around but must have been feeling equally ready to be done moving, as he returned without any clear and convincing evidence of any need to go ashore. The next day I stepped foot on the island to accompany Jon to the immigration office where we checked out of St. Vincent. Several hours later we navigated our way through the hundred or so boats anchored in Carriacou to check in. Our sightseeing on the island was limited to the dock for immigration and the dock of the Purple Turtle where we ate a delicious pizza with callalou (a spinach-like vegetable), bacon, and egg, and drank our first couple of Stags. We called it a night so we could get up nice and early to complete the final 37 miles of our long voyage. Within the first hour of leaving Carriacou, we were questioning our decision to go out that day. We were headed downwind with only the jib out when the first squall came through, so we reduced sail and comfortably managed the 30 knot gusts. The wind calmed a bit so we put up the main sail, but not long afterward the wind kicked up and hovered on either side of 30 knots for 30 tense minutes. This was around the time we were nearing the underwater volcano, Kick ‘em Jenny. We thought that instead of going around the outside of the cautionary zone we would run for the cover of the other islands on the inside track of the volcano. The wind and current had other ideas and we ended up going straight over the volcano as the boat ahead of us had also done. We didn’t think much of it until a couple weeks later when we were talking to friends who directed us to various news articles, informing us that when the volcano is degassing, all of the bubbles could lower the water’s density to the point that a boat could lose buoyancy and sink! I guess we’ll make sure to go around it on the way back. Soon we could see mainland Grenada in the distance. I didn’t want to get too excited and say we had reached our destination while we still had 25 miles to go before we would be safely anchored, but the increasing proximity to our goal brought increasing relief. Mostly it felt surreal to find ourselves at this milestone – the island we had talked about for months where we would be able to stop and rest for awhile – and I’m not sure if it’s really even sunk in yet that we actually did it. We’ve been pushing onward in a southerly direction for nine months, with the first few months spent working to escape the cold and the last hurrying to get out of the hurricane zone. We’ve visited 35 islands in nine countries and traveled 3500 miles. Spending the next four months in the same place seems an impossibly long time. That is, until I think about the work that we should probably be doing on the boat before we make the long return trip. But those thoughts can wait for now. My plan for the next several days and maybe even weeks, is to settle in and just enjoy not moving. Anytime we’re anticipating doing an overnight sail, we’re always a little bit nervous. Just the idea that the weather might go bad in the middle of the night when I’m tired, a little seasick, and mostly blind, starts to tie my stomach in knots. But while there is usually a moment or two of discomfort or anxiety, overall it isn’t as bad as I fear it will be. When we left Martinique for our last overnight before Grenada, it’s fair to say that we were both dreading it. The forecast called for 20 knot winds with gusts to 25 and 5-6 foot sees. We were very relieved to find mostly 3-4 foot waves for the majority of our 100 nautical mile journey. Our plan was that as long as the weather was comfortable we would pass by St. Lucia, then steer clear of St. Vincent on our way to Bequia (which is actually part of St. Vincent). Mainland St. Vincent has developed a bit of a bad reputation among cruisers for its questionable safety, so we knew we wouldn’t be stopping there unless we did some more research first. Since the weather was decent, we were happy enough to pass over our planned bail out point in Saint Lucia and sailed through the night. Early in the morning the next day, Jon was having a nap as we sailed just a mile or two offshore down the coast of St. Vincent. I thought – not for the first time – that the islands are really the most beautiful when you’re looking at them from a distance. Which led me to other sentiments that I’m just now realizing are already plainly iterated in the song, From a Distance. After one rain squall I saw a rainbow. We were completely becalmed and motoring for the next downpour, and afterward I saw a giant pod of dolphins and smelled the strong fragrance of spices wafting over from the land. It wasn’t as good as having a whale jump out of the water right in front of your face on your watch – twice – but it was alright. 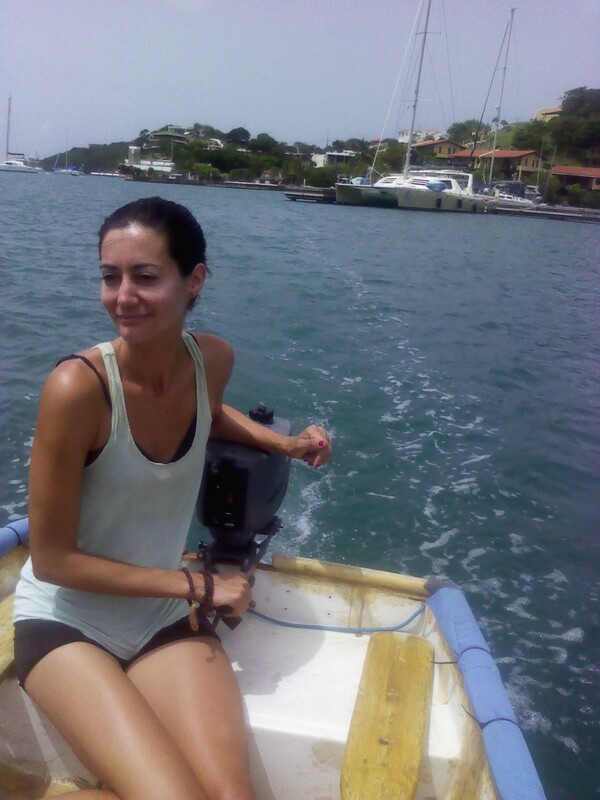 We were anchored in Admiralty Bay, Bequia, by 2:00pm, with plenty of time to clear in before the customs office closed. We really enjoyed strolling the Belmont Walkway which connects to another trail wrapping halfway around Admiralty Bay so we walked it multiple times, stopping for a drink at one of the beachfront bars. We took a long walk up to the top of Mount Pleasant and back down to Ravine Bay to see the blow hole there, and it did not disappoint. We stopped multiple times at the Whaleboner, hoping it would be open so we could have a drink. Although the fact that it was closed down meant that we were able to take photos of ourselves at the bar without actually paying for any drinks, so it worked out perfectly. Just a little obstacle in the road. No blog post is truly complete without a photo of goats.